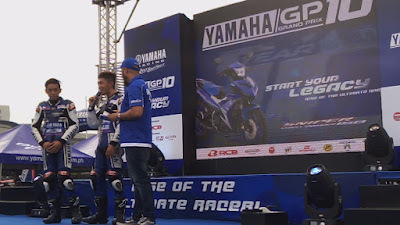 Last March 17, 2019, bikers and race enthusiasts gathered at the first leg of Yamaha Gran Prix 10 held at Robinsons Novaliches, Quezon City. 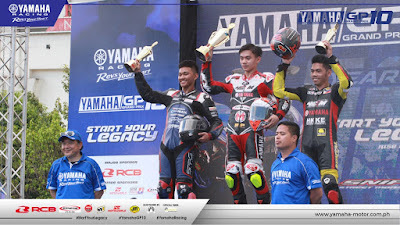 In the said event, Yamaha Philippines recognized the National Team duo of Masato “The Chairman” Fernando and McKinley Kyle “Wonder Boy” Paz for winning the recently-concluded Asia Road Racing Championship. As representatives to the FIM Asia Road Racing Championship, McKinley Kyle Paz led the charge with a resounding win and claimed the 1st position giving the country its first taste of the victory. The Philippine contingent also earned the best team award for this race and will do everything to prepare for another grueling round against Asia’s best to keep our flag at the top of the ARRC. The tandem serves as inspiration to riders who are eyeing to be the best racer they can be. This season kicked off with the annual categories of the YGP 150 Underbone Championship, All-female Category, Dealer Cup Race and Sniper 150 one-make race complemented by 160 Open AT, Club and Fun Races. 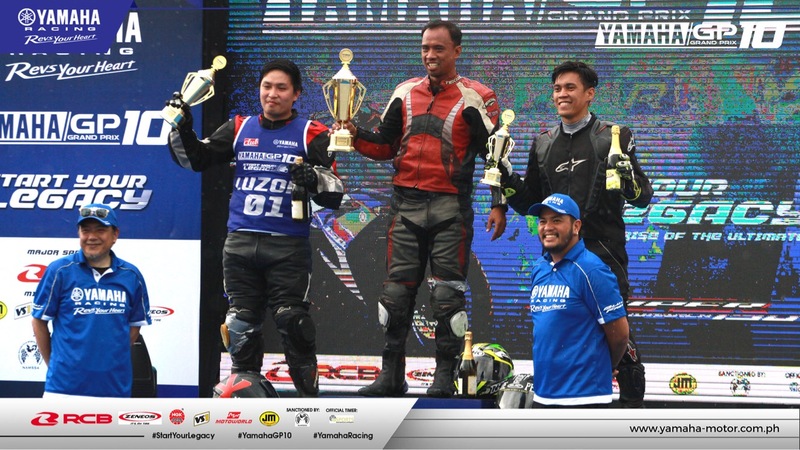 The YGP 150 Underbone Season Championship was composed of top riders from From Luzon, Visayas, and Mindanao utilizing the Sniper150 fitting the racers who wants to take home the titles. They all had one goal – to race towards the finish line. During Race 1, the battle was between Robert Ryan Espiritu and Garry Caneda. Determined to be on the first spot, Espiritu created a great distance on the last lap leaving Caneda at second place and Niel John Centeno at third. In Race 2, every rider was eyeing to get the title from Espiritu. Niel John Centeno made a great impression in the first lap but Espiritu was not to be denied as he claimed the back to back top finish. The Overall standings for this leg had Espiritu at first, Centeno at second, and Onahon at third. In the All-female category, through the great speed of Mio Sporty, Justine Bethany Tolentino showed why she is the reigning champion with a repeat victory and outclassing the field in the Luzon leg. Jasmin Jao was impressive and only trailed the leader by a one-second difference after starting from the eighth spot. While last year’s 1st runner up, Erika Ondillo, pushed through the pack with a third-place finish. 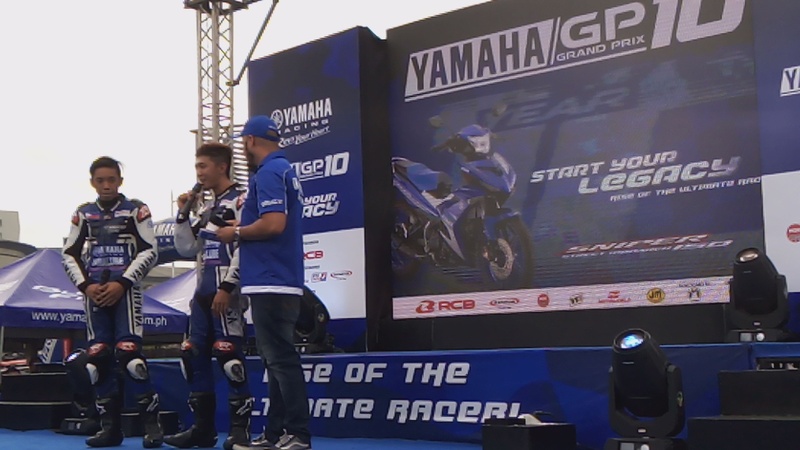 The Dealer Cup Race consisted of MotorAce, New Nemar, FMN Industrial, Rhean Marketing, LYR Motorhub, and DES Marketing, all eager to showcase the Yamaha brand beyond their shop. Maximizing the record-breaking Sight115, each rider was ready to bring home the coveted championship and a season’s worth of bragging rights. After 12 laps, Emerson Inguito of MotorAce emerged on top followed by Ephraim Onahon of Rhean Marketing and JR Daguio of LYR Motorhub. In the Sniper 150 one-make race, the crowd witnessed why this motorcycle is the trusted vessel of Yamaha’s Champion riders. The speed and precision was evident in every corner of the racetrack. This allowed JC Adia to unleash his full potential to win it all. He was swiftly followed by Tommy Topel and Ramon Franco. The Yamaha Grand Prix is where the racing dreams turn into reality and those aspiring racers will soon be one of the Filipino racing icons. This competition is the perfect avenue to cater your passion for racing. In this 10th season, Yamaha is off to an epic start with dramatic wins and runaway victories. Follow the leaders as they race to keep their top spots in the next leg slated on May 26 in Mindanao.